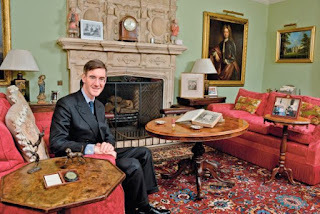 Rees-Mogg - "Man of the People"
In the news today is a 'scuffle' that erupted at an event in Bristol attended by Jacob Rees-Mogg, the Conservative Member for the Constituency of the 17th Century. Initially caused by some 'Anarchist' idiots that showed up wearing face coverings and shouting agressively, it erupted into violence as a white-shirted Rees-Mogg supporter decided to dive in with fists flying. 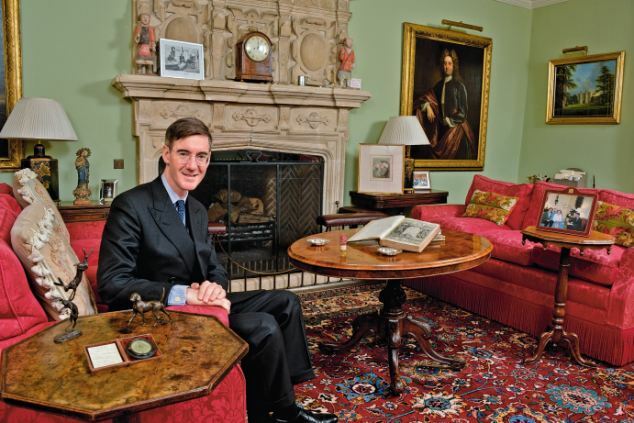 Still, the media of course aimed Left and blamed the Anarchists, who at the point of violence were actually having a heated - but entirely legal - discussion with Rees-Mogg. 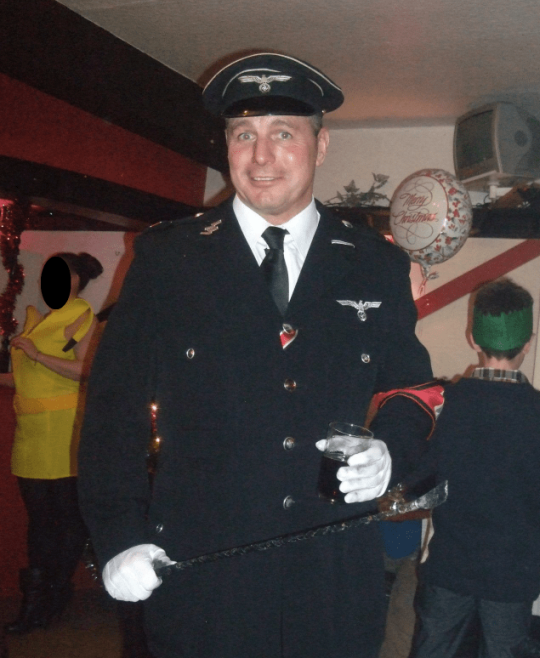 Rees-Mogg will no doubt be delighted with what transpired next : Britain First came to his aid. 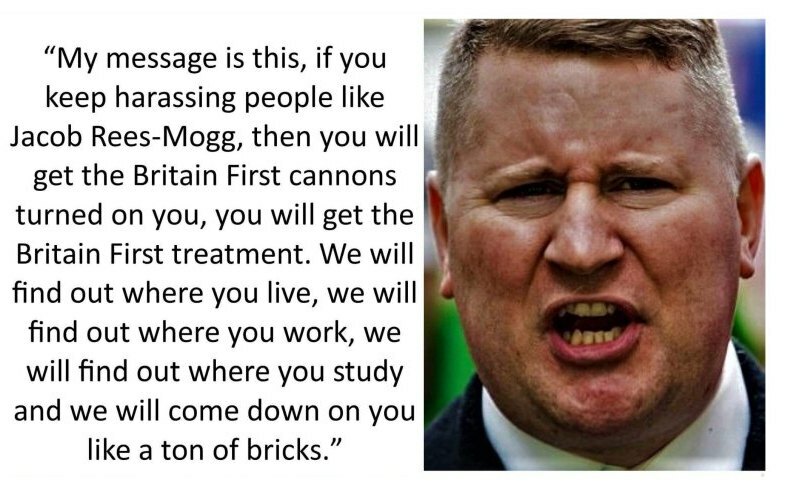 Paul Golding, the current Co-Leader, at this moment is on trial with Jayda Fransen in Folkestone for Aggravated Religeous Harassment. On bail for the trial, he decided to make a video - for some reason, while driving - in which he made some chilling threats. 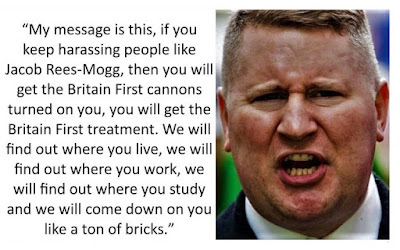 Such threats of violence - for a man on bail - are so inflamatory that Met Police have of course been advised. 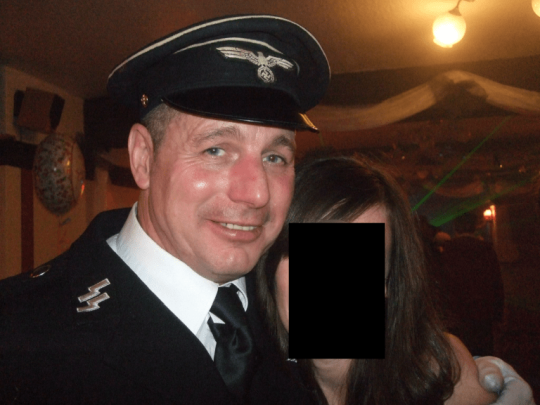 Oh, and look who the 'white-shirted thug' who leapt to Rees-Mogg's defence turned out to be - Paul Townsley, a Bristol Martial Arts Instructor ... with a fetish for Nazi Uniforms.